Dean DeLisle has positively impacted thousands of people around the globe and worked with a number of major corporations. As one of the most respected individuals in the industry there are quite a few people who have offered to give a testimonial of the experiences they have had working with him. Dean has a lot of experience in business networking and is eager to share it with others. As an instructor, he helped me tap into my network and used his knowledge to provide me with insights I otherwise would not have had. Dean’s class was one of the best classes I have taken for my career. The tools, skills, and disciplined approach I learned will be invaluable for my career development. Dean is one of the most skillful career coaches I’ve ever met. He is honest, organized, energetic, and creative. His observations about my career development were spot-on and extremely helpful. Many times, I witnessed him connect with students and give them insight, confidence, and instilled discipline. I recommend him for any professional at any level, from undergraduate students to Fortune 500 CEOs. Dean is a highly conscientious manager who is well versed in the subject matter. He does a great job of communicating ideas and is able to effectively follow up to ensure proficiency. After spending the last several weeks with Dean, the way I think about my life has changed. Dean shows you how to strategize and leverage your power behind the age-old saying, “Everything happens for a reason.” The decisions you make create those reasons in the background before anything happens. His advice is so compelling that I’ve started to share his instructions with others. Simply wonderful. You will not be disappointed! Dean is an excellent speaker with a great depth of knowledge in networking, and a teaching style that keeps the audience engaged. His mastery of the subject, coupled with his ability to share with the class in a digestible and useful way, added value to my MBA. This class should not be missed by anyone at UIC. Dean is a very goal-oriented instructor; he is responsible, patient and nice with every student. He is good at using different ways and tools to inspire students’ interest, treats each student fairly, and encourages each person to express their own opinion and create new ideas. He combines the theory and practice very well, which is very important and means a lot for students. Dean is an excellent professor with a clear plan for his class. He is very engaging, and both his lectures and reading assignments were very helpful. He has a fantastic ability to push students in a way that will help them individually. I would definitely recommend the class he taught to all MBA students. I signed up for LinkedIn coaching from Dean. Over 3 sessions, Dean walked me through how to get more value from my use of LinkedIn. The strategies Dean taught me are highly professional and focus on building real relationships with people. The old adage is true – people do business with people they know. I’m already getting noticed far more than I ever did on my own and I have two deals pending that came directly from Dean’s coaching. I would highly recommend Dean and his team. Dean is an extraordinary individual who has proven to be successful in helping many different people become better at marketing themselves and their business. Dean has helped me and numerous others communicate the most important aspects of our business in a direct and understandable manner, which is extremely important in today’s digital world. I recommend Dean for anyone who would like to learn the most effective ways of being in touch with their target market. Dean is a true master. It has been a pleasure working with Dean & his organization, Forward Progress. Dean has been providing superb Social Media & Online Marketing coaching to members of our Business Accelerator Program. The information he delivers is succinct, and is in a simple to follow step-by-step form that enables our members to take their business to the next level. In addition to coaching, Dean has successfully increased the membership of our program through his targeted online marketing expertise. I would highly recommend Dean, whether you are looking to leverage social media, pay-per-click, or other online marketing techniques to grow your business. You will certainly not be disappointed as you watch him excel and deliver beyond his expected results. Since my exposure to the Social Media Networking phase of my life (after the NASA downsizing began in 2010) my brother told me about the professional network named “LinkedIn.” He explained it as the “Facebook” for professionals and to contact Dean DeLisle. Being that he is such an awesome brother I took his advice and immediately contacted Mr. Dean DeLisle. Without hesitation Dean scheduled a time and we spoke on the phone and he gave me the basic steps to get started with LinkedIn. Dean always remained true to his word when scheduling speaking meetings via the phone to get me up and running. Since [I first contacted Dean], I have taken several free online webinars and have learned so much! His team calls and asks how they can assist in growing my network. Fast forward two years I have people viewing my profile like crazy & asking to be connected since I have taken his advice and free online webinars through Forward Progress, Inc.! Thanks Dean for your ethics, loyalty, and well-paced courses you offer online to people around the globe! Dean thinks about results 24/7. Through this relentless focus, Dean has been an outstanding coach as we have worked together to expand my capacity as a CEO. He keeps me focused on mission, holds my feet to the fire when I waver and inspires me to take risks and achieve that which would be impossible without his support. I highly recommend Dean. Dean and his team at Forward Progress are the best in this field of social media marketing and sales. He has helped us tremendously over the past year at the Institute for Social + Emotional Intelligence in getting the word out about our programs. His advice is always right on target, he’s on time and on budget, and he’s very personable. They are a delight to work with and Dean and the whole team are extraordinarily knowledgeable. They have our highest recommendation. Dean’s knowledge of social media, specifically LinkedIn, allowed me to close some of the gaps that existed for me. His insight on how to leverage this social media site in an effort for better prospecting and therefore increase sales was superb. He packed a lot of information into two short hours and sometimes it felt like “drinking from the fire hydrant.” I would recommend his class especially if you want to work smarter and not harder in just 20 minutes a day. This boot camp offered us ground up info on social networking! I recommend Dean and Forward Progress to all of my colleagues! As I launched my non-profit organization Bangladesh6G, I needed to run several web campaigns, including effectively reaching my target audience for a petition for Nobel Prize winner Dr. Muhammad Yunus, launching an event to show a documentary movie about Dr. Yunus and more. Dean was absolutely instrumental in helping me figure out a strategy for all my campaigns and execute it. He recommended several web platforms and vendors that quickly and easily got me to not only become a social media person, but to get the results I was looking for. Dean is highly available and is very keen in his coaching of any marketing campaign, especially a web-based campaign. He was very quickly able to understand the heart of my mission and figure our several ways for me to hit my goals. He was always a couple steps ahead of my own mission and continued to foster a very powerful vision of what else I could do. I am glad to have followed his advice and hit the goals I never thought possible with my non-profit. I am now working on executing my goals for 2012 since my 2011 goals have already been exceeded! It wouldn’t have happened without Dean. Dean has been providing social media and networking coaching for our practice of therapists and it has been hugely successful. We have a successful website, we have increased our Google rankings, most of us have started successful blogs, and we are getting to be pros at LinkedIn, Facebook, and Twitter. We now stand above the competition in our market, thanks to Dean and Forward Progress! Dean DeLisle is “the man” and Forward Progress is “the firm” when it comes to growing your business in this “brave new world” in which we operate today! The guidance we received from Dean was infinitely more valuable than the financial investment we made for his services! Is there anyone more knowledgeable in the field of marketing via “social media” portals? I highly doubt it! In addition, Dean was personal, flexible, strong, demanding (in a good way!) and very clear in his communication and his teaching! I can say with conviction that as a result of the coaching we had with Dean, we have a much clearer sense of DIRECTION, we are much more CONFIDENT in our plan… and we have a powerful new CAPABILITY for achieving profitable growth! I highly recommend Dean DeLisle! We hired Dean to conduct LinkedIn training for our sales force and could not be happier with the results. Our people are constantly working Linked In to develop their network, research opportunities, and make new connections. In work sessions, he spends time answering questions and leading you through the steps to use social networking tools to their fullest extent. An investment in his training session is time and money well spent. Dean is an absolute pleasure to know and work with. He is always upbeat and squeezes the most out of every day and every encounter with others. His passion for life is infectious and his clients are rejuvenated every time they meet with him. His social media webinar, presented as part of the Business Accelerator Program, attracted the largest single event audience to-date for our program. He is also the social media coach for our agency that executes our program. As a result of his coaching we’ve experienced a tremendous increase in our social media results – Facebook membership is up 274% and LinkedIn membership is up 2675% (all in just 5 short weeks). He has certainly earned my endorsement. My best recommendation is that if you ever have the chance to meet Dean – don’t let that opportunity slip by. I don’t know anyone who is better than Dean at monetizing your personal network. He has an in-depth understanding of social media tools from both a technology and marketing perspective. I invited Dean to speak to my networking organization and he received rave reviews. I’m an avid fan and continue to attend his seminars and webinars. Dean is a master in the social networking arena. I have worked with other social media strategists, but none have been able to show me the power of social networking like Dean. When you engage Dean, he builds the strategy and then quickly gets down and dirty in the implementation. He’s patient, yet pushy. He’s forward thinking, yet practical. Dean is an excellent coach that works extremely hard to make sure your efforts see results. Wow! Dean showed me real quick e-marketing tactics that I could really put to use right away. “I didn’t know that was possible”, but Dean did and it helped me make more money with a fraction of the effort. Thanks Dean! I’ve attended several of Dean’s webinars in conjunction with the WABC (World-Wide Association of Business Coaches) and I must say he is extremely knowledgeable, thorough but easily understandable in his presentations and over-delivers every time. I look forward to each and every one. In addition to his tremendous knowledge of social network marketing, Dean has cared about and become part of our team at CLE. Dean uses his positive can-do attitude to inspire us to accomplish goals we never thought possible. As a result of Dean’s coaching, I moved from being a skeptic to an enthusiastic proponent of social network development. Dean and Forward Progress are taking CLE to our next level in the fulfillment of our mission. Dean DeLisle is truly a social media guru. I thought I was a social media expert because I had lots of friends on Facebook; however, in one evening his knowledge changed my life. I not only figured out how to link my social media presence across platforms, but I also got inspired to start working with small businesses and individuals to implement what he taught me. I highly recommend him as both a knowledgeable expert in social media and a trusted adviser to help you and/or your business to reach its fullest potential. Thank you Dean for helping to develop a vision for me and for my career. You are the best and I look forward to deepening our relationship through the W.I.N. training at the Wright Leadership Institute on Friday May 7th, 2010. Dean – thank you for teaching our group at Brillante Multicultural Marketing Group the power of social media. What I have learned is very informative, easy to follow and has increased by networking beyond what I thought was possible. Thanks for all your help! In a relatively short period of time Dean introduced me to capabilities on Linkedin I would have spent months to uncover, if ever. His thorough approach and insight provided me the ability to become productive in weeks instead of months. I have begun to generate significant opportunities in less than 1 month. If at all possible, I will never miss the opportunity to be “trained, taught, coached, motivated, and inspired”, by Dean. His methods are tried and true and he makes sure his presentations make sense to all. I encourage anyone and everyone to find out when and where Dean will be and to get there! I thought I knew the power of LinkedIn. Dean has “empowered” me on LinkedIn and my confidence in using this system has increased tenfold. During Dean’s social media trainings he effectively shows groups the power of our social connections to expand our reach and potential. 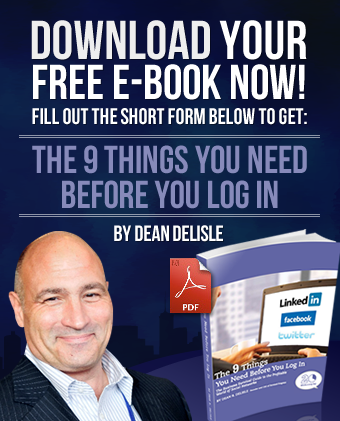 Despite a crowded field of social networking experts, Dean DeLisle ranks above the others. He has a pragmatic approach to effectively integrating social media into an organization. His proprietary training approach is very effective and reflects his own business acumen as an experienced entrepreneur. We’ve adopted his programs at our consulting firm and recommended him to our clients. Don’t miss the chance to work with Dean. We hired Dean in December and I couldn’t be happier about all the skills he has taught our staff on how to use social marketing. I’ve never met anyone in this field that better knows how to translate the elusiveness of network marketing into actually developing relationships and getting business. Dean is a master at this game! Dean was an engaging, fun and patient teacher – he started where we were and helped us see the potential of social media on a personal project. Our group walked away with practical tips and a lot more knowledge and enthusiasm about the social media landscape. Dean DeLisle is one of the single biggest investments we have ever made in our business. From day one, he spoke about how “we” can get things done. Not only is he results oriented, he is inspiring, creative, and does whatever it takes to get the job done. He also goes above and beyond – by personally investing in everyone involved in the project. I highly recommend using his services. Until attending Dean’s webinar on “How to Build and Optimize Your LinkedIn Account for New Business”, I merely flirted with LinkedIn. Now I understand its features better than ever before and I’m building a game plan for ongoing success – and that’s after just one of the two sessions. Great value and presented very clearly – even for this reluctant techie! As a content provider to my list of financial and consultative professionals, Dean has demonstrated an exceptional command of the intricacies of using social media as the ultimate client relationship tool. His webinar was both accessible and actionable, with considerable emphasis upon implementing the strategies he outlined, versus just “listening to the expert.” I feel my list profited tremendously from his instruction and would highly recommend Dean to anyone looking for a social media coach or instructor. Dean did a great job with coaching us on how to reach more people with a fundraiser. Within a few minutes, we were all reaching way more people than I ever imagined. Dean is the highest value and integrity I have experienced in 30 years of business. The way he has gotten behind our project is way over and above the call of duty. His creativity, drive, and partnership is total. I fear that sharing how great he is will reduce our support, but his gifts are so great and his staff so fantastic they must be exposed as broadly as possible. I previously found it very difficult to figure out how to use social media in my business. I found him to be incredibly inspirational and supportive and on my side in getting myself blogging, facebooking, and linkedining. He is knowledgeable and determined and very invested in our company’s success. I’m so glad we are working with him! Having worked with Dean over the last couple of years, I’ve grown to appreciate his dynamic approach to business development. He is a great influence on business, bringing high value methods which expand the company’s growth and influence using social networks and proven marketing methods. I’ve seen dramatic results recently using his LinkedIn Top 10 tips, nearly doubling our deal flow. Dean and his company, Forward Progress, are two of the best things to happen to our company in a long time. President at Arch Vacations Inc.
Dean DeLise is the most knowledgeable person I met that knows how to use Social Networking effectively for business results. I highly recommend Dean and his organization. Using his services gained me tremendous bottom line value. I know you will achieve great results working with Dean. I’ve watched two of Dean’s webinars and have gotten so much out of both of them. He is a real expert at Social Media and can teach you how to make the connections you need to grow your business. I give him 5 out of 5 stars. Dean is offering information that is very helpful to those who are not experienced with LinkedIn! I am already using the tactics suggested but it reinforces to others at the company the value of using LinkedIn. There is always a benefit to having someone else reinforce what you have been saying all along. I just listed to a presentation by Dean on How to Generate Leads using Social Networks. This presentation was an excellent synopsis and provided a great introduction for people considering these tools. Dean, once engaged, becomes part of your company! His ability to address needed change then provide the tools and support is a resource more companies need to know about. Over the past 2 decades, his firm has provided priceless services and documented methodology that we continue to apply and reuse within our businesses. Dean’s company name Forward Progress is perfect. Dean is all aboout forward motion and is one of the best inspirationalists I have met. He gives of himself because he cares. He will give you the right advice instead of telling you exactly what you want to hear. He will expect the best of you and expect you to expect the best of yourself. One thing you can count on is you will always get the best from Dean. I am glad he is part of my network and my life. Dean introduced a new level of business diligence to our agency during our year-plus engagement. His methodology for setting a life-long platform for solid business practices, as well as his systematic and ongoing review of progress and adaptation, has caused us to truly internalize the new processes he brought in. Dean is the best trainer of quantified and measurable process development we have worked with. He is also sincerely concerned for our success, and has remained an active colleague and partner since the time of our formal consulting engagement. Dean is a wonderful coach…introspective, systematic and results oriented. As a client, he was our guiding light, now as a colleague I look forward to doing great things together! Dean’s Coaching has helped me grow my company larger than I ever thought possible. Thank You DEAN!!! Bottom line: Dean is a man of his word and he gets the job done. Dean has an aptitude for understanding clients that makes him stand out from the hundreds of other VPs you might find out there. He pays close attention to what you say during consultation sessions and tries to capture the essence of your requirements that make both business and financial sense. In other words, he doesn’t just create something that looks like everything else you would see from any other business, he ensures that he takes the time and effort to understand your business so it make sure that it reflects the values of your website, brand, products and organization. Bringing Dean on to work with your organization on any initiative would be a smart business decision. If you at least don’t bring him into your conversations you are missing out on a smart asset with a lot of ideas to bring to the table. I have worked with Dean as a business partner when he was with JDS Group and found the working relationship with Dean to be very professional and Dean to be very organized and focused on his needs. Dean has been diligent about keeping in contact with me through Forward Progress and I have seen Dean display the same professional traits. I highly recommend Dean and his Forward Progress program to any business partner I have and encourage them to contact Dean and discuss his expertise in networking and sales growth. I encourage attending one of his seminars to any sales staff who wants to see growth in these areas.